Every year, hundreds of people attend the Oklahoma Full Auto Shoot, cultivating a love for assault weapons in an era of mass violence. It was Saturday at the 16th-annual Oklahoma Full Auto Shoot and Trade Show, and I had my thumbs on the trigger of a Browning M1919, prepared to unleash hellacious destruction on an unsuspecting refrigerator. Suddenly, the dirt along the edge of the hill appeared to vibrate. Half a second later, a series of detonations turned the ridgeline to smoke, knocking into my chest and announcing the official commencement of the weekend. Then everyone began shooting. In less than a minute, my 80 M1919 rounds were gone, having ventilated the cab of a flatbed truck. The shoot—OFASTS, as it’s known to regulars—might best be characterized as a cross between a classic car show and a demolition derby. Its founder, a strong-jawed Oklahoman named Mike Friend, stresses a family-friendly atmosphere where safety is paramount. Orange-shirted Range Officers monitor the firing line with steely-eyed vigilance; alcohol is not allowed on the premises; and children under 10 are admitted free with parental supervision. I came here to answer a question: Why do people find it fun to attend a festival where they can shoot the country’s most powerful civilian weaponry during a time of mass violence? In many people’s view, gun ownership is integral to America’s cultural identity. But guns also cause a significant number of preventable deaths every year. So OFASTS offers a distinctive combination of recreation and regulation: Fans of automatic weapons have the chance to use some of the most heavily tracked armaments in the country, in an environment akin to a county fair. Many of the event’s attendees were Oklahoma residents who have visited OFASTS for years. Some were retired, while others were in their 20s; a number had grandparents or children in tow. In previous years, overseas visitors have hailed from places like Israel and New Zealand. OFASTS may be their only opportunity to use fully automatic weapons, firing their favorite video-game gun or using the equipment of their enlisted years. Plus, as I discovered, shooting was a genuine thrill—not unlike the adrenaline rush of driving a car at illegally high speeds. The shoot’s exhibitors were wary of me at first. One man walked away at the mention of an interview. A couple from Minnesota requested that I avoid taking pictures of their faces, as they could end up in a government database. There was a palpable sense of fear in interacting with the quote-unquote media—capable of twisting gun enthusiasts’ words and maligning their character. It was only when I explained that I was also shooting this weekend that people became comfortable. One exhibitor, Bill Stover, a Title II/III machine gun dealer and owner of an Oklahoma arms store, had brought his entire extended family: his wife Teresa, his nephews, their spouses, and assorted children. Teresa introduced me to the group, explaining that I was a writer from New York. I added that I was also a shooter. “Heck yeah you are,” Teresa said cheerfully. Although Stover was busy wrangling ammo boxes and assembling tents, he made time to sit with me. He looked like many a dad: a bristle-brush mustache, glasses with Transitions lenses, and a slim frame beneath a loose T-shirt. “I got into machine guns because it’s the kind of hobby that also makes money,” Stover said. That’s because these weapons are now considerably rare: The Firearm Owners Protection Act of 1986 banned the sale of newly manufactured automatic weapons to civilians. Guns produced before the ban are individually monitored by the Bureau of Alcohol, Tobacco, Firearms, and Explosives, and they command premium prices. An AK-47 might cost a collector upwards of $15,000, Stover said; a .50-caliber Browning M2 could easily run to $80,000. Some people buy them exclusively as an investment, Stover told me. “The machine-gun community is a tight-knit one,” he explained, describing a small network of enthusiasts and collectors, all with dealer licenses and relationships with the ATF. There was a sense of camaraderie among this group, he said—the exhibitors at the shoot were less competitors than kindred spirits. 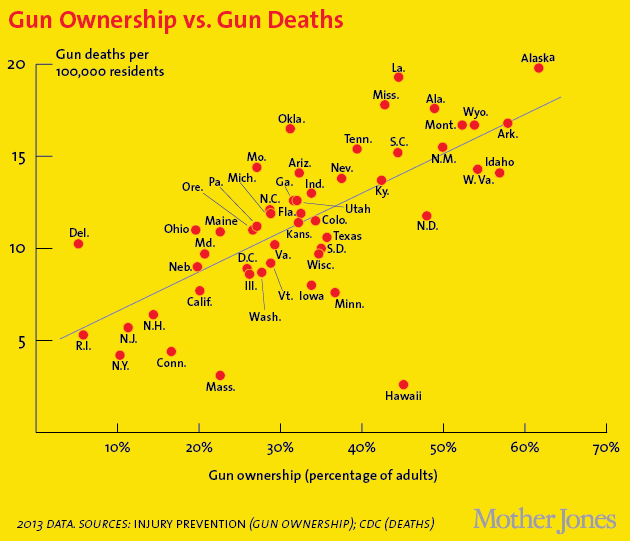 As it turns out, the link between automatic weapons and gun-related deaths is not a strong one. In 1934, the National Firearms Act prohibited citizens from possessing machine guns without complying with stringent licensing requirements and regulations. Since then, machine-gun crime has become so rare as to be only sporadically recorded. A special 2009 report by the California Attorney General’s office found that only 2 percent of the guns surveyed in crimes that year were machine guns. Of incarcerated inmates surveyed by the Bureau of Justice Statistics, less than 2 percent used a fully-automatic or military-style semi-automatic firearm in their crime. * The FBI’s supplemental homicide reports do not even distinguish machine guns as a distinct category of weapon. Moreover, of the approximately 30,000 total gun deaths recorded annually by the CDC, two-thirds are suicides and one-third are homicides. According to the FBI, mass shootings—defined as an incident in which four or more people are targeted indiscriminately—conservatively account for approximately 100 to 200 deaths annually. In 2012, only 322 people were killed with a rifle of any kind, including semi-automatics. The FBI further estimates that the vast majority of gun homicides are handgun-related. While easy access to guns is related to gun deaths in the aggregate, access to fully automatic weapons is not. As Hiebert saw it, policy questions about the recreational sale and ownership of guns are not really questions about guns at all. Rather, they are about a set of related issues that the government seemed incapable of confronting: mental-health infrastructure, for example, or persistent poverty. He expressed dismay over the country’s general political climate and the ability of this year’s presidential choices to change it. “Much as I hate to, I might have to vote for Hillary,” he said. Regardless of the outcome in November, he said, he will feel that the U.S. is headed in a troubling direction, with no one offering satisfying answers to the massive social and economic problems that have exacerbated the gun debate. Saturday’s flagship event was a spectacle called “Kill the Car.” Two old minivans, painted bright yellow and adorned with the words “ISIS Taxi” were filled with explosives and rolled down the hill until, in a hail of gunfire, they detonated. It was a gesture that might have seemed insensitive to some visitors. But OFASTS was also radically inclusive in its own way. Anyone who loved both America and guns was welcome, no questions asked. During a break in firing, Justin Harvel, the founder of Black Rain Ordnance, sat down with me. In 2014, Black Rain made news for creating an AR variant that was 100-percent compliant with New York State’s SAFE Act. The act outlaws certain features of assault-style rifles, and Black Rain’s response was clearly meant as a statement: We’ll play your game just to show you how misguided it is. In Harvel’s view, guns had been demonized by overzealous politicians and a media prone to sensationalism. He pointed to the much higher rate of gun suicide versus gun homicide as evidence that many vocal anti-gun liberals do not understand the underlying dynamics and risk factors associated with guns. In the wake of high-profile mass shootings, politicians tended to focus on “feel-good” measures like limiting assault-weapon magazine capacity, missing the bigger picture while painting law-abiding gun enthusiasts as villains, he argued. Although research does show a link between rates of gun ownership and gun deaths, Harvel’s point seemed to be one of civility rather than statistics. Supporting gun-rights does not make people supporters of mass murder—but gun owners are sometimes portrayed that way, he argued, pointing for example to Katie Couric’s documentary, Under The Gun. Jayson seemed to be offering more than just endorsement of a hobby. The debate over guns in America isn’t wholly a matter of issues and policies. It’s also the product of different ways of life drifting into conflict. At this moment in a field in Oklahoma, guns are as commonplace as cars, a matter of education for children, weekend recreation for adults, and economic survival for exhibitors. Laws are observed and safety procedures meticulously followed. The larger implication of Jayson’s comment seemed to be that one can't begin to discuss guns until one understands them firsthand—not just their responsible use, but their fundamental integration into American lives and livelihoods. This was clear at OFASTS: The event was unquestionably fun, a safe and accessible forum for people to try guns they might never otherwise be able to use. Everywhere, families were hanging out: Older men talked shop, parents bonded with their children, couples sat in matching camp chairs. But at the same time, it’s also impossible to ignore the unintended consequences of American gun culture. Gun-homicide rates in the U.S. are among the highest in the developed world. Anti-suicide advocates point out that guns increase the success rate of suicide attempts. Simple proliferation of guns has made toddlers into shooters. This is without even mentioning the threat to women involved in domestic disputes, or the disproportionate impact of handguns on African American communities. Although the anti-gun left and the pro-gun right squabble over the validity of individual statistics, the combined weight of evidence is becoming irrefutable. The country’s long fight over guns can be seen as a lapse in its national capacity for empathy—a failure of those on either side of the issue to appreciate that one town’s gun festival is another town’s murder-statistic, and one legislator’s common-sense regulation is another business owner’s financially onerous limitation. The first step toward any reconciliation of policy positions will be an acknowledgement from individuals on both sides that they can be both right and wrong at the same time. Bill and Teresa Stover invited me over to take a turn with a tracer-loaded M16 before night settled on the first Saturday of the OFASTS weekend. With the gun snugged against my shoulder, I rattled away at the remains of a camper van, and Teresa snapped pictures. “Nice control,” Stover told me, taking the gun from my hands and clapping me on the back. I felt both proud and encouraged. If there is compromise to be found in the morass of the gun debate, perhaps it looks like this: a few people sharing a minute of unlikely companionship and rounds of fire beneath the enormous Oklahoma sky. * This article has been updated to clarify that the semi-automatic firearms carried by less than 2 percent of incarcerated inmates are referred to as “military-style” guns by the Bureau of Justice Statistics. John B. Fischer is a writer based in New York.